Look at that blue sky! Look at those mountains! It’s only a 20 minute drive, but it’s nice to have pretty scenery to look at. For all of you who asked about the mall…Yes, it is the one at I-25 and 144th Ave. It is about a 15 minute drive from the house. Really only about 5 minutes on the highway, the rest of the time is getting to and from the highway. I’m going to go back on Sunday and try to get my gift card. If it’s nice, I think we’ll take the whole family and let the other boys check out the play area too. They were really jealous that Benji got to go on Thursday and they didn’t. (I’m having a total time warp. I was just thinking that it was Saturday. sheesh.) I think it’s time for me to go to bed. okay, well it IS saturday now. I know what you mean when you think it’s the wrong day. I keep losing thursdays. makes you nuts in those few minutes when you realize you might have the days wrong. 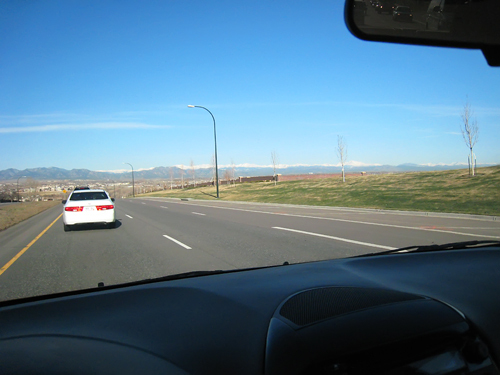 I love the mtn range view from out here in the NW denver burbs. I’d love to add a little turret to my house so I could sit up there and soak in the view. right now, if I sit on my couch in a specific spot, I can see a tiny glimpse of one mountain between houses across the street. it’s not enough. I love the mountains! My eyes still well up when I drive down our street or look out my scraproom window and see them. I am so glad to be HOME (even three years later:). I love driving West at any time of the day. It is so gorgeous! I lived on the East Coast for most of my life, moving West my senior year of high school (totally robbed of that last year with friends). People out here would tell me that when I went back East that I would miss the mountains and feel closterphobic with all the trees, and smothered by the humidity back East. I didn’t believe them. and THAT is where we will be tomorrow! we worked hard on the house all day today and will be back at it for the next SEVERAL days – it will be good to get some fresh air in. need to discuss jazzercise with you further….